TheWirk.com ~ voted BallHyped.com's 2010 "Best Independent Sports Blog": Celtics don't scare me, and I still need a ticket to the Super Bowl.... GO COLTS!!!! Celtics don't scare me, and I still need a ticket to the Super Bowl.... GO COLTS!!!! List of thoughts because I'm too tired to write paragraphs right now. 1. Yesterday, Pat's dad couldn't go to the game Celtics v Wizards game, so I got called up. Thanks, Pat. 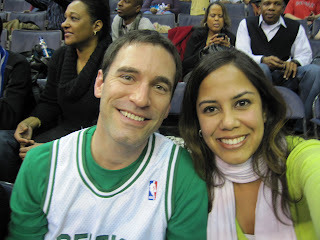 He's a Celtics fan so I compromised and wore lime green. I will not put a Celtics hat on my head. 2. I said to bet the Celtics -5. If you did, you WON. The Celtics didn't really play until the 4th Q, so sorry if you had to sweat it out. 2. The Celtics are not scary. As a Cavs fan, they'll have to show me more, before I BEGIN to consider them a credible threat in the East. Garnett is definitely NOT back, even though he's playing. 3. 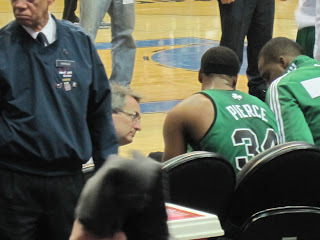 The only scare of the game happened when Paul Pierce went down, but he got back up and continued playing ~ eventually. Paul Pierce getting treated on the bench. 4. 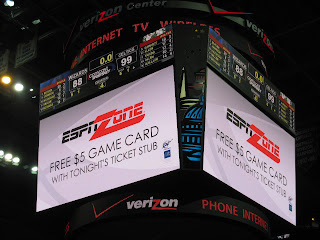 The Wizards are running some sort of promotion now through Chik Fil-A. Chik Fil-A picks a player on the visiting team, and if that player misses both of his free throws, everyone in the arena gets a free sandwich. Thank you, Big Baby Davis ~ for your poor shooting and my free lunch tomorrow (i.e. if I can drag myself out of my apartment and into the cold). 5. Can't watch another Wizards game for a long time. Enough is a enough. I walk out of the Verizon Center stressed out, and this is not good. 6. 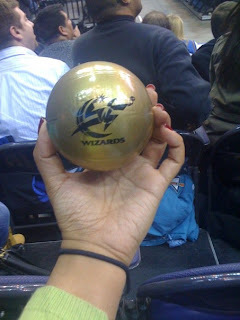 I caught/picked up one of those free give away balls that they throw out into the crowd. I was not standing and waving for it like a 6 year old child. This proves you can get free stuff by sitting and "playing it cool". 6. Watching ESPN Sportscenter, and I'm disgusted. You'd think Kobe Bryant walked on water last night. Yes, I get it. He's the all-time leading scorer for the franchise. However, in my opinion, he's NOT the best Laker ever. If you make me choose between Kobe or Magic ~ I'll take Magic any day. To me, Magic is the Lakers' heart. 7. Working on plans for NBA All-Star weekend. 8. I'm not Oprah and the last thing I want to do is read/sell books, but here's one for you. I came across my copy recently, and it started me thinking. If you've never read "Homecourt Advantage" by Rita Ewing and Crystal McCrary ~ check it out. It reads quickly and will give you a good idea of what it's like to be a WAG in the NBA. 1. Headed to Miami on Wednesday night/Thursday morning for the Super Bowl. I need/want to be on the ground for all the festivities. 2. Dwight Freeney and a torn ligament?!?! Oh no!!!! Dwight, please play!!!!! GO COLTS!!!! 3. I need a ticket to the Super Bowl. Still. 2. Trying to come up with other sports ideas/events for this blog. 3. Apologies to my trivia team, who I ditched to go to the game last night. 4. Shout out to Fogdog and the Bryant brothers who I saw/ran into while at the game. No mention of the mini-ball you caught? And yes, thanks to Big Baby for the free sammiches! ahhhh, man.... now i need to re-edit this... it's coming!